I met up with Jim and Dave Markwell in Pheriche after a successful summit day on Lobuche (20,161′) It was a bittersweet reunion, it was great to see both Jim and Dave recovering quickly; however I was disappointed I was not able to climb and summit with either of them. Our summit day was picture perfect, our group gathered for a quick headlamp lit breakfast around 3:15 AM and was on the trail before 4. It was a very cold morning, light wind, clear skies – perferct day for a climb. The route ascended quickly in a mix of snow and rock, our progress was steady up to the glaicer. With crampons on and the sun rising, temps were increasing quickly and our group spread out as we hit the fixed lines. A cloudless bluebird day opened up for the IMG group, providing excellent climing conditions. It was a very successful climning day, everyone in our group made the summit and returned safely to Lobuche base camp. I was able to speak with Jim this week from EBC. He and Dave made it back to base camp without any issues and were able to sneak in a climb to a high camp on Pumori to continue their acclimitization. Back at camp and rested, they joined the rest of the climbing team and prepared to start the rotations up through the Khumbu. He and his sherpa made their first climb through the icefall and back to base camp without any issues. 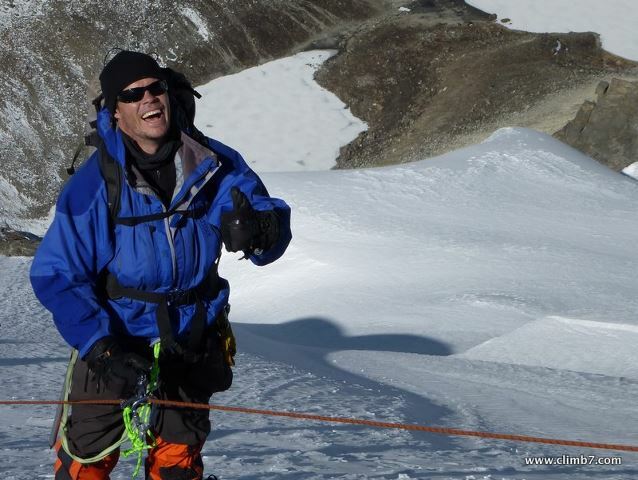 It sounds like Jim and his sherpa are a great climbing team. Jim mentioned they were back in camp by 7am, taking full advantage of the safest time to climb in the Khumbu. Unfortunately the return to camp was met with another small set back. A second round of Gi issues attacked and set Jim back a few days. After a quick round of Cipro and some tent time, Jim was planning his first rotation to Camps I and II with guide Eric Remza and climbers Jon (Colorado) and Jeff (California) and their sherpas. Jim will spend 2 nights at Camp I, push higher to Camp II for an additional 2 nights, then decend back to basecamp to rest and recover. I anticipate hearing from Jim again early next week and will provide updates from his first rotation. More to follow.